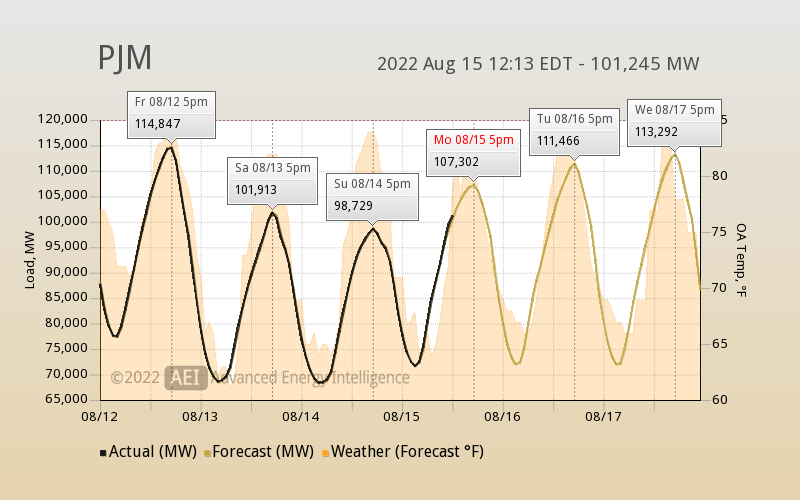 This FREE service will send you ISO Demand Alerts when the regional grid is approaching a peak demand condition. Service Notice: AEI ISO Alerts will resume on Monday, June 17th. For more information read our AEI ISO Alerts 2018 Service Notice post in News. Service Notice: AEI ISO Alerts will resume on Monday, June 17th. We are performing maintenance during the month of APRIL 2019. Charts and data on this and other pages may be unreliable at any given time during that period. We will update this page when the work is completed. If your facility usage correlates with the typical weather and grid demand patterns, this helpful service can send you real-time alerts when your regional ISO is approaching a calendar-month peak or more importantly, an annual peak that may be used to determine your ICAP tag. 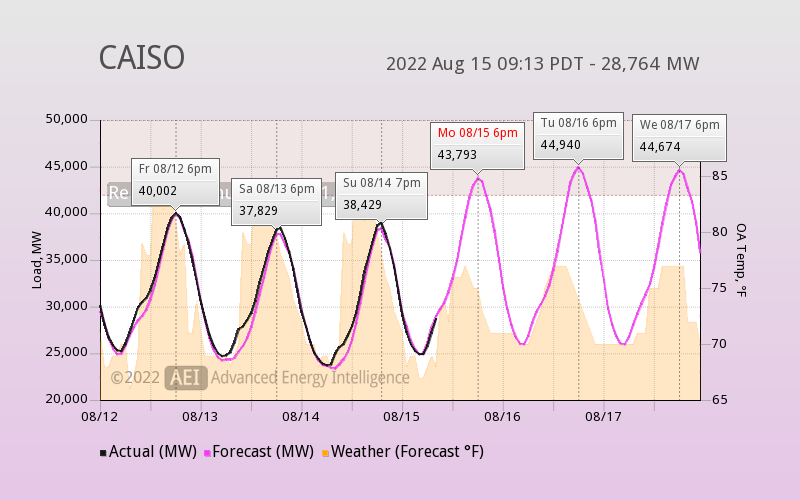 There are several subscription services that will send out a morning report with a prediction about the grid conditions for the day, but with an AEI ISO Alert you get real-time notifications that are much more timely. The forecast may predict a peak at 5pm, but it could turn out that the peak for the day occurs at 2pm. We pay attention every 5 minutes, so when we see the grid is blowing through their forecast you'll see a text message at 1pm to let you know. Do we predict the future? Not really. But we do know from the history that all RTOs miss their forecasts by at least a few percent on a regular basis - both in magnitude and time-of-day - especially during the daytime hours that matter most. So when we see the grid is running ahead of forecast on a day with a high probability of hitting a new annual peak, you'll know about in time to react. Charts autorefresh every few minutes. Click any chart for a more detailed view. 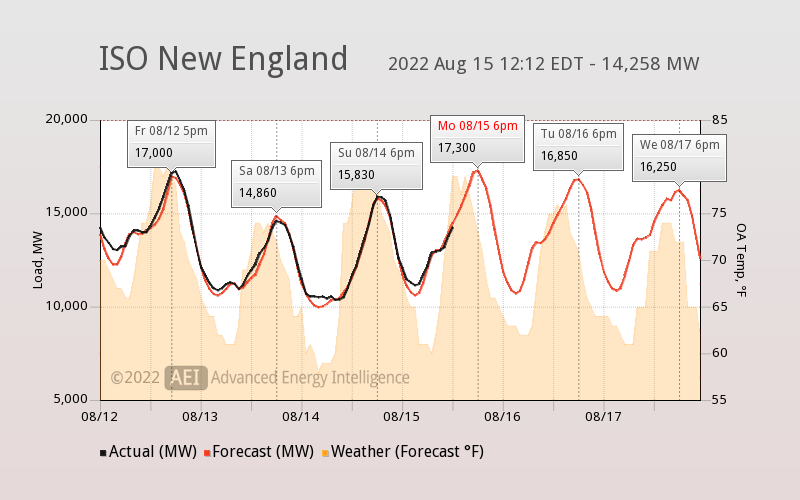 Current ISO New England, NY ISO, MISO, PJM and CA-ISO actual real-time loads and forecast are part of the morning report sent each weekday during the summer cooling season. 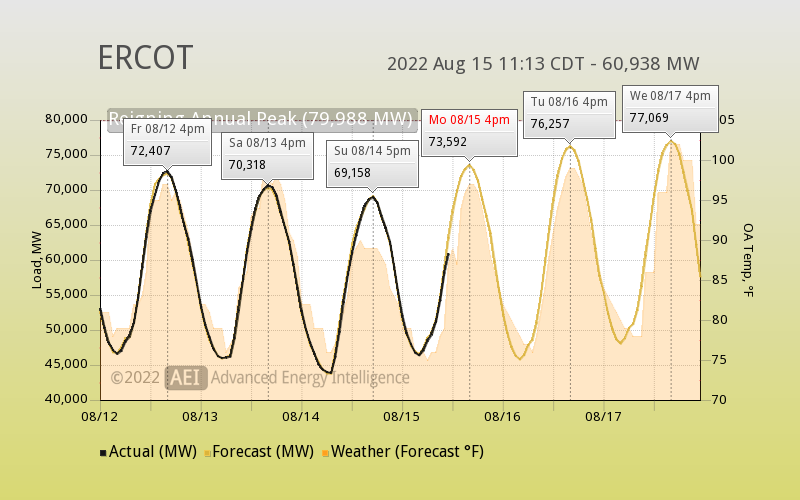 The current actual loads are evaluated every 15 minutes and an SMS or E-Mail alert is sent an hour or two before a new annual peak might occur. Click on the charts above for a bigger picture. System-wide mid-day load shedding measures over the past years have had the effect of pushing the peak hour later into the day, sometimes as late as 5pm to 7pm when commuters return home from work and immediately crank up the AC. Commercial spaces feel confident they can avoid the predicted peak just by going into the standard end-of-day setback mode. But we've seen cases where the peak for the day comes earlier than predicted and voila, the commercial space is caught running at full tilt at the same time the grid is peaking. If it so happens that ISO calls the annual hour on that day, that facility is now stuck with a very high ICAP tag that will cost them dearly for the entirety of the next fiscal year. A facility's installed capacity "ICAP" tag - the coincident demand of the facility at the time of the ISO peak annual hour - is multiplied against the capacity charge rates set by the ISO. In FY17/18 for ISO New England that rate is $15.00/kW, and for FY18/19 it will be $9.55/kW. Depending on whether there are commodity contracts in place to blend or hide this charge, the facility may be paying $15.00 for each kW of their ICAP each and every month. So while an ICAP tag is assigned to a facility based on a single hour in the year, it's the gift that keeps on giving - in the form of higher demand charges on every monthly bill through the year. And by gift, we mean your gift to your utility. A quick word about false positives and over-reacting to the morning report. Some nervous facilities see a high likelihood of an annual peak hour and will simply engage an all-or-nothing DR protocol as soon as they walk into the building that morning. In most cases it will turn out that the annual peak is not met. With the DR in place, usage is lower - and that's good - but the aggressive response to a peak prediction that doesn't occur may have come at the expense of building comfort, resulting in occupants who feel like you've cried wolf. During the summer of 2016, ISO New England exceeded 23,000 MW approximately 5% of the time and only set a new annual peak on 5 occasions. 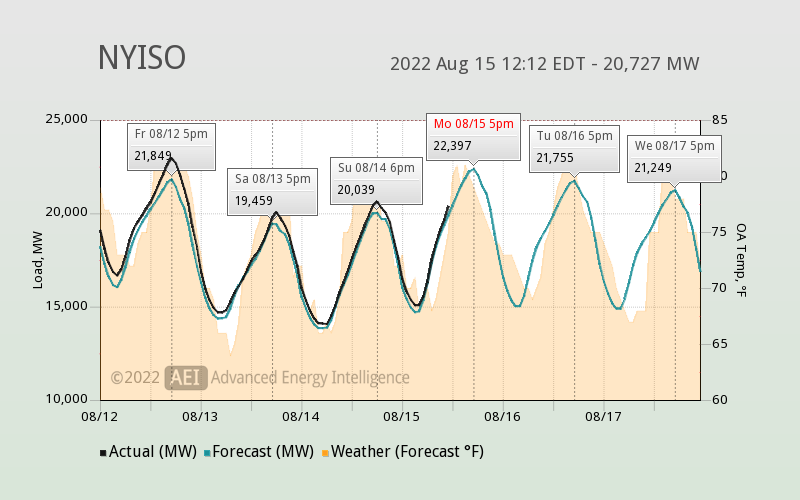 Rather than warn of a possible high peak on half of the 62 days in July and August, users of the AEI ISO Alert service were notified on far fewer days and with 2 to 4 hour notice of those new peaks. Sign-up for free at AEI ISO Alerts on our website. All we need is your name, mobile phone and e-mail address. We use that information in connection with this service, and to send you an occasional monthly or quarterly newsletter. We do not provide your information to any third-parties. Currently, the service supports the ISO New England, NY ISO, MISO and PJM. CAISO, ERCOT and SPP will be coming up soon. 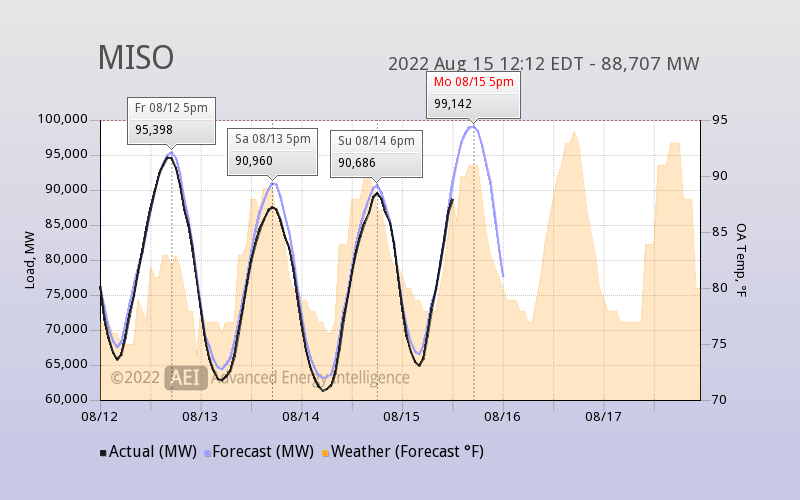 During July and August, we send out a "morning email" which relays the ISO forecast for the next 3 days to help you set up your daily demand response plan. After the "morning" report, you will receive an SMS and/or E-Mail alert when ISO demand is approaching a new peak. Users can customize the notification settings, such as the threshold and frequency for messages. Integrates with AEI Soft Start Real-Time so that your alerts can incorporate real-time loads from your buildings in addition to the regional situation. Whether or not the grid is peaking, it can be helpful to know if your building is likely to hit a new billing period peak. If your rate schedule has a demand charge component, this intelligence could help you save 1% to 10% of your monthly electric bill every month of the year. Integrates with AEI Energy Map for customers with 10 or more buildings in their portfolio. Given that "peak season" is typically associated with the summer cooling months of June through September, the service is somewhat dormant during most of the year but is very active in the cooling season. This means you might not hear anything for a long while, and then find that SMS messages become more frequent in July and August once the trends have become established and new annual or monthly peaks are more likely.